Etienne-Maurice Falconet, active at Sèvres 1757-1766. The present model is a reduction of the marble sculpture, now in the Louvre, exhibited at the Salon of 1757. For a discussion on this model see Émile Bougeois, 'Le biscuit de Sèvres au XVIIIe siècle', Paris, 1909, vol. I, p. 51. 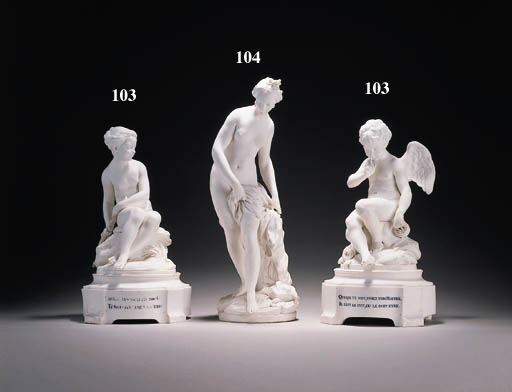 See also Svend Eriksen and Geoffrey de Bellaigue, Sèvres Porcelain, Vincennes and Sèvres 1740-1800, London 1987, fig. 127, for an example in the Copenhagen Museum of Decorative Arts and p. 144 for an explanation of the incised marks found on biscuit figures. Other examples recently sold include Elizabeth Parke Firestone Collection, Christie's New York, 21 March 1991, lot 133 and an Anon. sale, Christie's New York, 21 May 1997, lot 85.